Congratulations to Sharon (AKS 2nd degree Black belt) and her fiance Chris! 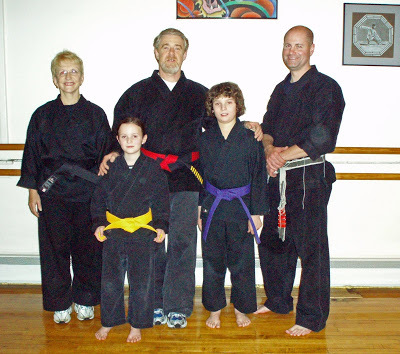 Front row: Promoted to Yellow belt Alexis D. and her brother Peter promoted to Purple belt – Congratulations to them on their accomplishment…..the Staff too! Alexis is a Little Dragons graduate and has been practicing for 2 1/2 years and Peter has been practicing for 4 years…. We have had a fair amount of sickness reported this past week…both from students and staff. I hope you are all healing, with no further complications…..so far so good on the complications! I’ve got a few tips that I’ve come across that I would like to share. Thank you Janee, Wes, Lisa, MaryColleen for the input and articles. Besides the main points of washing hands often and trying to “Keep Hands-off-the-face”, sanitizing common things that we touch….like keyboards, phones, door knobs, hand rails…etcetera. *Nettie Pot or salt water spray along with a good old fashion hard nose blowing at least once per day. *Drink as much of warm liquids as you can (green tea especially). Drinking warm liquids has the same effect a gargling, but in the reverse direction. They wash off proliferating viruses from the throat into the stomach where they cannot survive, proliferate or do any harm. *Boost your natural immunity with foods that are rich in Vitamin C and D – If you have to supplement with Vitamin C tablets that has Zinc to boost absorption. The only portals of entry are the nostrils and mouth/throat. In a global epidemic of this nature, it’s almost impossible to avoid coming into contact with H1N1 in spite of all precautions. It takes a few day’s for the virus to proliferate to sufficient levels to give you symptoms (your still contagious though). If you get them out of the nose and throat before they can proliferate…It could make the crucial difference or at least mitigate the viral load….. and …..it can’t hurt. Wash clothing often, especially after any exposure to the virus. The virus is contagious for 2-3 day’s before any symptoms and I’ve heard from reliable sources…up to a week after the fever breaks (without med’s)…Yikes! I so appreciate it when those that are sick stay home and take care of themselves. It’s very important, considerate and respectful to everyone at the studio.